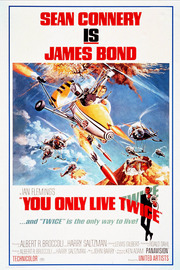 You Only Live Twice is the fifth Eon Productions James Bond film. It stars Sean Connery as James Bond and was released in 1967. The film follows James Bond as he travels to japan to foil a plan by villain Ernst Stavro Blofeld and his organisation SPECTRE to provoke World War III by hijacking Russian and American spacecraft from his lair inside a dead volcano.